His Political and Journalistic Activity. Historian of Italian literature and philologist; born at Pisa (Tuscany), Feb. 20, 1835. He is the youngest of five brothers, all of whom have achieved fame in the careers they have chosen. Alessandro received his first education at a private school of Florence known as the "Istituto dei Padri di Famiglia," where he had as masters Nicolo Giorgetti and Cesare Scortabelli. Especial attention was there paid to literary disquisitions, and to Italian rhetoric and prosody, and the young D'Ancona devoted most of his energies to these latter subjects. At the age of fifteen he composed two short poems, elegies on the death of his teacher Giorgetti, which, although they bear many traces of youthful extravagance, are nevertheless excellent imitations of classical verse, both in form and meter. Three years later he demonstrated his knowledge of medieval Italian literary sources, his critical sense, and his scientific methods of investigation by writing an essay on Giovanni Domenico, or—as he is better known—Tommaso Campanella, the metaphysician and political reformer, a contemporary of Galileo. 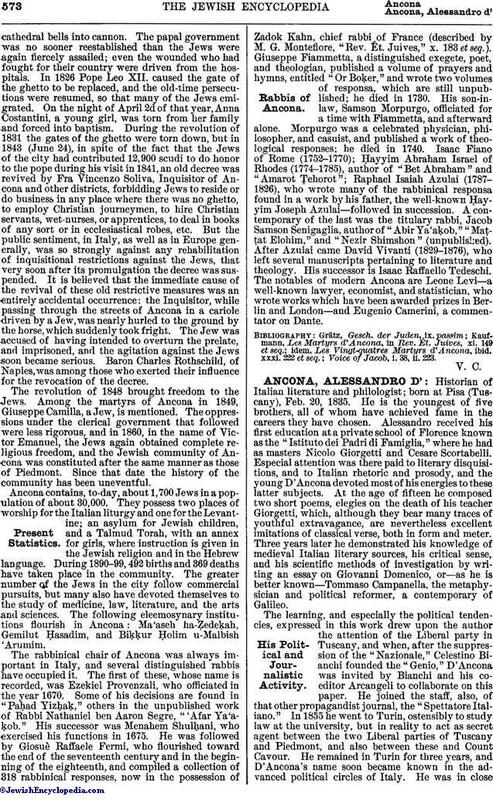 The learning, and especially the political-tendencies, expressed in this work drew upon the author the attention of the Liberal party in Tuscany, and when, after the suppression of the "Nazionale," Celestino Bianchi founded the "Genio," D'Ancona was invited by Bianchi and his coeditor Arcangeli to collaborate on this paper. He joined the staff, also, of that other propagandist journal, the "Spettatore Italiano." In 1855 he went to Turin, ostensibly to study law at the university, but in reality to act as secret agent between the two Liberal parties of Tuscany and Piedmont, and also between these and Count Cavour. He remained in Turin for three years, and D'Ancona's name soon became known in the advanced political circles of Italy. He was in closerelations of friendship with Carlo Luigi Farini, and in the Società Nazionale (National Society) he represented Tuscany. When Cavour's compatriots decided to offer this statesman his bust by the sculptor Velo, it was Alessandro d'Ancona who was selected to make the presentation speech. A similar honor was conferred upon him at the close of the Crimean war, when the patriots of Tuscany presented General La Marmora with a sword. On the fall of the government of Leopold II. in Tuscany (April 27, 1859), D'Ancona set out for Florence—his former home—and arriving there assumed the humble post of secretary of the Second Army Corps of central Italy. But his friends soon found more suitable occupation for him; immediately after the treaty of Villafranca he was given the editorship of the advanced Liberal journal "La Nazione," which had been founded by Ricasoli and Salvagnuoli. In spite of all his political activity, D'Ancona still found time to pursue his philological studies, and, through the efforts of his friend Salvagnuoli, he was, in 1860, appointed deputy-professor of Italian literature at the university of his native town, Pisa. The official occupant of this chair, though he never actually lectured, was the celebrated critic De Sanctis, whose full successor D'Ancona became the year following. His entire work, after 1861, lay in the field of philology, his researches being directed to the origin and gradual development of Italian literature. D'Ancona's position among the philologists of Italy is a most prominent one, and is to be measured not only by the actual importance of his works, but above all by the new standard, in scope and method, set by him and a few of his contemporaries, such as Carducci, Comparetti, and Mussafia. Before the advent of these men the study of the medieval Italian texts was, it is true, zealously pursued; but the criterion in the treatment of these texts was the individual eclecticism, the esthetic taste, or the private ends of the commentator. The scientific methods of philological investigation recently inaugurated in Germany were as yet unknown in Italy (though an exception must be made in the case of Emiliani-Giudici), and the "historical point of view" was entirely neglected by men of such erudition even as Fanfani and the poet Giacomo Leopardi. Especially was this the case with the most absorbing of topics in Italian literature, that of Dante. All those who had literary, political, or religious theories to defend or refute sought in Dante (and invariably found there) corroborative arguments (see especially Gabriele Rossetti, "Lo Spirito Antipapale"). Alessandro d'Ancona was in every way prepared to join the small circle of literary historians to whom this revolution in the methods of investigation was due. His first work, the study of the life and works of Campanella, already mentioned, though written when he was a mere youth, was a thorough, impartial disquisition upon the literary value, the political and religious ideas of the unfortunate Dominican. The essay paved the way for the work which D'Ancona published soon afterward, "Opere di Tommaso Campanella" (2 vols., Turin, 1854), the basis of all subsequent researches concerning Campanella. When, therefore, under the direction of F. Zambrini, the two serial publications of Old Italian texts were begun, the "Collezione di Antiche Scritture Inedite o Rare" (Collection of Old Works, either Unpublished or Rare; published by Nistri, at Pisa), and the "Scelta di Curiosità" (Collection of Curious Works; published at Bologna, by Romagnoli), D'Ancona was among the first contributors. In the former of these two collections there appeared his edition of Agostino Velletri's "Storia di Ginevra degli Almieri" (1863), a study of the Latin work, "Attila Flagellum Dei" (1864), and an essay on the Seven Wise Men ("Il Libro dei Sette Savi," 1864); and in the latter he published several medieval legends, among which may be here mentioned those of Judas Iscariot ("La Leggenda di Vergogna, e Quella di Giuda Iscariote," 1869) and of Adam and Eve ("La Leggenda d'Adamo ed Eva," 1870). The philological researches pursued by D'Ancona comprise the whole field of early Italian literature. He entered into disquisitions on the various classes of the folk-lore material itself and its appearance and further development in Italy, as well as upon the form, popular or "learned," which the material finally assumed; but he studied, too, the individual works of the more cultured medieval writers. In 1875 he published a work on the early popular poetry of Italy, "Le Antiche Rime Volgari, Secondo la Lezione del Codice Vaticano 3193" (Ancient Popular Poems, from the Vatican Manuscript No. 3193; published at Bologna); in 1878 appeared another, "La Poesia Popolare Italiana" (Popular Italian Poetry; published at Leghorn); in 1881 he wrote his book on the popular songs of the province of Reggio ("Canti del Popolo Reggino," published at Naples); and finally, in 1889, he published still another work on the popular poetry of Italy ("Poemetti Popolari Italiani," published at Bologna), the various introductions to which "are written"—to use the words of another eminent philologist—"with as much science as taste" (see Gaston Paris, in "Romania," xviii. 508). An essay on a popular spiritual drama of Tuscany, a sort of "May-festival," which D'Ancona had written in 1869, gave rise to a more elaborate work concerning religious dramatic performances, or, as they are more popularly called, "mysteries," of Italy: "Sacre Rappresentazioni dei Secoli XIV., XV., e XVI." (Sacred Performances of the Fourteenth, Fifteenth, and Sixteenth Centuries; 3 vols., Florence, 1872); and this was followed, in 1877, by his work on the origin of Italian dramatic literature, which the author ascribes to these very religious plays ("Origine del Teatro in Italia," published at Florence). 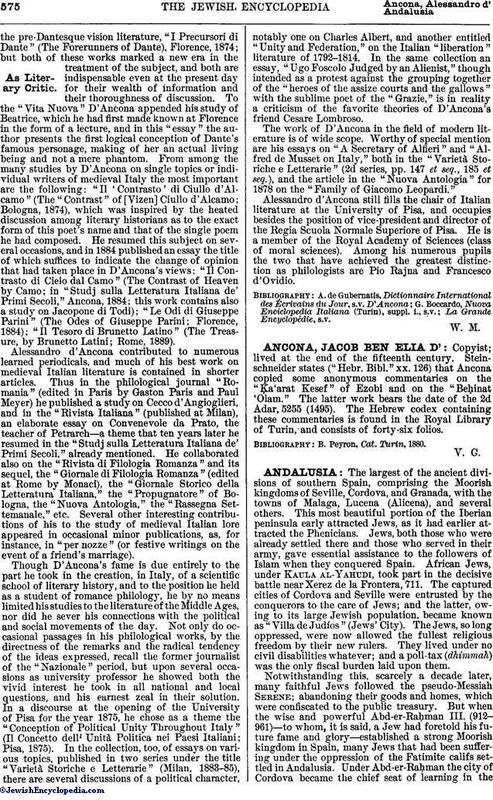 In this field of research may be classed also D'Ancona's work on the original sources of the "Novellino," where the author reviews all the "novella material" to be found in the ancient literatures of the world ("Fonti del Novellino," published in 1873); also his "Due Farse del Secolo XVI." (Two Farces of the Sixteenth Century; Bologna, 1882), a noteworthy addition to the history of Italian literature. In the field of what is termed the "higher literary history"—in the study of belles-lettres—too, D'Ancona's work occupies a very important position. His contribution to the Dante literature, besides a few articles of minor length, consists of only two volumes, his edition of "Vita Nuova" (The New Life), Pisa, 1872 (2d ed., 1884), and his study ofthe pre-Dantesque vision literature, "I Precursori di Dante" (The Forerunners of Dante), Florence, 1874; but both of these works marked a new era in the treatment of the subject, and both are indispensable even at the present day for their wealth of information and their thoroughness of discussion. To the "Vita Nuova" D'Ancona appended his study of Beatrice, which he had first made known at Florence in the form of a lecture, and in this "essay" the author presents the first logical conception of Dante's famous personage, making of her an actual living being and not a mere phantom. 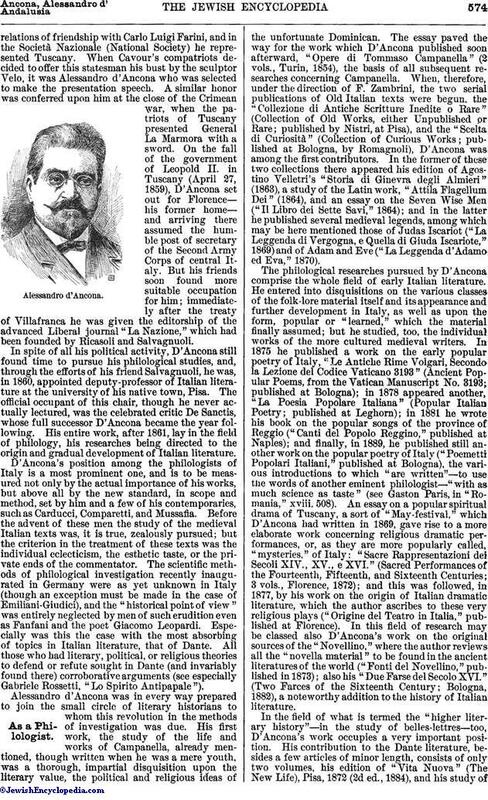 From among the many studies by D'Ancona on single topics or individual writers of medieval Italy the most important are the following: "Il 'Contrasto' di Ciullo d'Alcamo" (The "Contrast" of [Vizen] Ciullo d'Alcamo; Bologna, 1874), which was inspired by the heated discussion among literary historians as to the exact form of this poet's name and that of the single poem he had composed. He resumed this subject on several occasions, and in 1884 published an essay the title of which suffices to indicate the change of opinion that had taken place in D'Ancona's views: "Il Contrasto di Cielo dal Camo" (The Contrast of Heaven by Camo; in "Studj sulla Letteratura Italiana de' Primi Secoli," Ancona, 1884; this work contains also a study on Jacopone di Todi); "Le Odi di Giuseppe Parini" (The Odes of Giuseppe Parini; Florence, 1884); "Il Tesoro di Brunetto Latino" (The Treasure, by Brunetto Latini; Rome, 1889). Alessandro d'Ancona contributed to numerous learned periodicals, and much of his best work on medieval Italian literature is contained in shorter articles. Thus in the philological journal "Romania" (edited in Paris by Gaston Paris and Paul Meyer) he published a study on Cecco d'Angioglieri, and in the "Rivista Italiana" (published at Milan), an elaborate essay on Convenevole da Prato, the teacher of Petrarch—a theme that ten years later he resumed in the "Studj sulla Letteratura Italiana de' Primi Secoli," already mentioned. He collaborated also on the "Rivista di Filologia Romanza" and its sequel, the "Giornale di Filologia Romanza" (edited at Rome by Monaci), the "Giornale Storico della Letteratura Italiana," the "Propugnatore" of Bologna, the "Nuova Antologia," the "Rassegna Settemanale," etc. Several other interesting contributions of his to the study of medieval Italian lore appeared in occasional minor publications, as, for instance, in "per nozze" (or festive writings on the event of a friend's marriage). Though D'Ancona's fame is due entirely to the part he took in the creation, in Italy, of a scientific school of literary history, and to the position he held as a student of romance philology, he by no means limited his studies to the literature of the Middle Ages, nor did he sever his connections with the political and social movements of the day. Not only do occasional passages in his philological works, by the directness of the remarks and the radical tendency of the ideas expressed, recall the former journalist of the "Nazionale" period, but upon several occasions as university professor he showed both the vivid interest he took in all national and local questions, and his earnest zeal in their solution. In a discourse at the opening of the University of Pisa for the year 1875, he chose as a theme the "Conception of Political Unity Throughout Italy" (Il Concetto dell' Unità Politica nei Paesi Italiani; Pisa, 1875). In the collection, too, of essays on various topics, published in two series under the title "Varietà Storiche e Letterarie" (Milan, 1883-85), there are several discussions of a political character, notably one on Charles Albert, and another entitled "Unity and Federation," on the Italian "liberation" literature of 1792-1814. In the same collection an essay, "Ugo Foscolo Judged by an Alienist," though intended as a protest against the grouping together of the "heroes of the assize courts and the gallows" with the sublime poet of the "Grazie," is in reality a criticism of the favorite theories of D'Ancona's friend Cesare Lombroso. The work of D'Ancona in the field of modern literature is of wide scope. Worthy of special mention are his essays on "A Secretary of Alfieri" and "Alfred de Musset on Italy," both in the "Varietà Storiche e Letterarie" (2d series, pp. 147 et seq., 185 et seq. ), and the article in the "Nuova Antologia" for 1878 on the "Family of Giacomo Leopardi." Alessandro d'Ancona still fills the chair of Italian literature at the University of Pisa, and occupies besides the position of vice-president and director of the Regia Scuola Normale Superiore of Pisa. He is a member of the Royal Academy of Sciences (class of moral sciences). Among his numerous pupils the two that have achieved the greatest distinction as philologists are Pio Rajna and Francesco d'Ovidio.